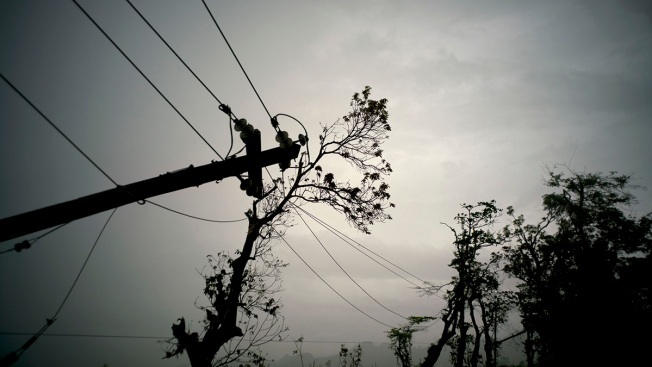 In this Oct. 16, 2017 file photo, power lines lay broken after the passage of Hurricane Maria in Dorado, Puerto Rico. An outrcry over a promised $750,000 salary for the CEO of the indebted Puerto Rico Electric Power Authority prompted him to quit less than 24 hours after assuming the position, along with four members of the board. Rafael Díaz Granados stepped aside instead of taking a pay cut ordered by Governor Ricardo Rosselló. Díaz Granados' predecessor, Walter Higgins had resigned as head of the power authority, known as PREPA, on Wednesday, after only four months in the job. The controversy erupted as Puerto Rico is trying to privitize the power company, which is $9 billion in debt after Hurricane Maria. Díaz Granados' expected $750,000 salary exceeded the $450,000 that Higgins earned. Rosselló ordered an income adjustment, saying the number was in no way proportional. "PREPA must temper the salary to what I am proposing or, alternatively, the members that are not willing to do so must resign their positions," he said. Díaz Granados said that it was a sacrifice to take this position for $750,000. "I am making a sacrifice on behalf of the people of Puerto Rico, because every day I am in Puerto Rico is a day that I can't be somewhere else where I could be earning a lot more," he said in a radio interview. By the end of the day, the governor had replaced two of the board members.